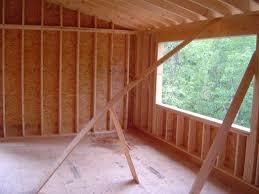 Building a room addition is an expensive endeavor and in general is not a do it yourself project. Typically a series of contractors are required in building a room addition. Most homeowners, however, hire a general contractor who provides the overall room addition cost estimate and handles the hiring and managing all of the other contractors (a.k.a. subcontractors). This said, sometimes homeowners elect to act as their own general contractor to save anywhere from 15 to 30% on the overall cost of the project. However, undertaking the role of a general contractor involves a lot of work. First and foremost, the homeowner needs to come up with the room addition cost estimate him or herself. And to do this he or she has to generate/obtain the room addition build plans, calculate the bill of material costs, and find, interview and hire all of the subcontractors. Then they need to schedule and manage the daily workings of a large team home construction project. So think twice before deciding to be your own general contractor on your room addition project. Now with all this said, I’ll focus the rest of this article on estimating home addition costs. Of note – you may want to consider using my Room Addition Bid Sheet that includes a separate Excel worksheet with an accurate home addition calculator as part of it. Building a room addition is an expensive proposition. Home remodeling contractors typically specify room addition costs in dollars per square foot to provide a rough order of magnitude cost estimate. Room addition cost estimates are commonly 30-50% higher on a cost per square foot basis then building a new home, due to the fact that a room addition typically is more complicated to build. A room addition is more complicated to build due to the fact that not only does it need to be constructed, but it also has to tie into the existing home in a structurally and aesthetically correct way. This effort takes time and money, both in the design and construction of the room addition. Consequently home construction contractors charge a premium when providing a room addition cost estimate. Room Addition Estimates Vary a Lot! Room addition cost estimates can vary dramatically due to a number of factors, chief amongst them being what is specified in the room addition plans. For example, room addition costs estimates of $80 to $130 per square foot for a basic family room addition is common. If the room addition includes bathrooms and/or a kitchen, the room addition costs can easily escalate to $200-250 per square foot. So for example, if your room addition plans specify the construction of 400 square feet of family room living space, without any type of bathroom or kitchen area, you can expect to pay $32,000 – $52,000 for a completed addition. If, on the other hand you are including a bathroom and/or kitchen, you could see room addition cost estimates as high as $100,000. Room addition cost estimates can also vary with market demand for building material and home construction labor. Price gouging is not uncommon during hot housing markets, so it is important to study contractor proposals carefully. 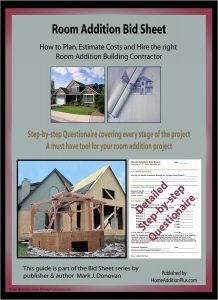 Use this Room Addition Bid Sheet to save money, time and hassles on your room addition project. The contractor is in business to make money, and his time and effort is money, so you need to expect some premium charge for the materials that he orders and has delivered to your room addition project. When obtaining room addition cost estimates make sure your contractor provides you with a comprehensive construction bid that includes a checklist of all the tasks to be performed, the material to be used, and a detailed schedule of when the work will be performed. To help in obtaining accurate and consistent room addition contractor quotes, see my Room Addition Bid Sheet. The Room Addition Bid Sheet provides a request for quote section that you can provide to prospective building contractors. It also includes a comprehensive room addition cost breakdown table, in Microsoft Excel format, that allows the contractor to include his projected room addition costs for every phase of the project. The key to obtaining accurate room addition cost estimates is to have a complete set of room addition plans and specifications. The more thorough your plan, the less likely for unwanted cost overrun surprises. By having a complete set of room addition plans, you can price out every single building material item, even down to the curtain rod. By including this level of specification you can avoid including TBDs and contractor allowances in the room addition cost estimates. TBDs and contractor allowances are the “third rails” of home addition projects as they inevitably lead to higher than anticipated room addition costs. 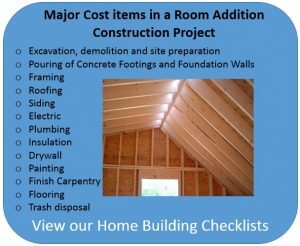 For more help on building a home addition, see HomeAdditionPlus.com’s Home Addition Bid Sheets. 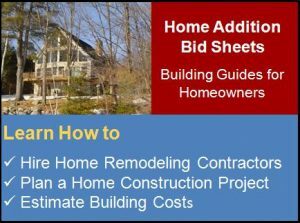 Our Home Addition Bid Sheets provide you with the knowledge and information on how to plan a home addition project, and what to look for when hiring contractors. They also include detailed cost breakdown tables and spreadsheets for estimating your own new home addition building costs. As part of the home addition bid sheet product is a separate Excel worksheet that includes an accurate home addition calculator. Fill out our 3-5 minute quick and easy form, and receive a free and accurate home addition price quote on a home addition from one of our prescreened and licensed home addition contractors. This process is free and there is no obligation to continue once you receive your house addition price estimate.